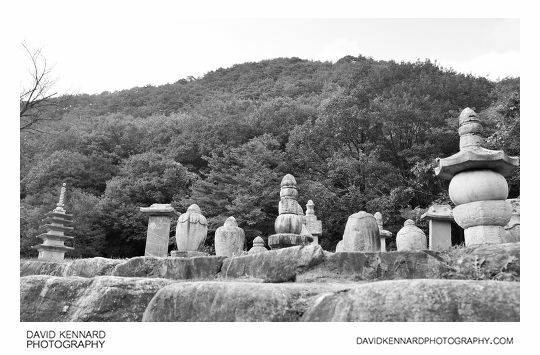 Walking back towards the entrance of Seoraksan National Park, we walked past a group of Stupas. The stupas contain the ashes of various Buddhist monks. I probably could have got a much better photo if I'd been on the same level as the stupas, but I couldn't see any steps nearby to get up there. 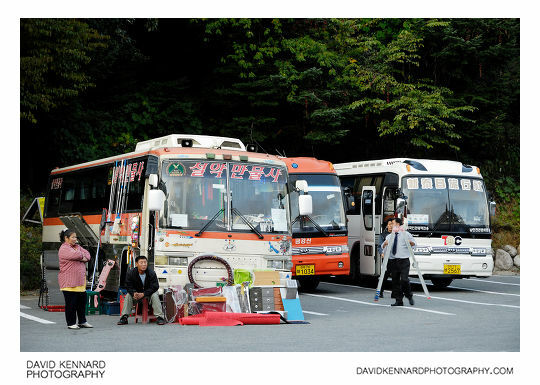 In the bus park there was an interesting couple with a load of stuff outside their bus. I'm not sure if they were selling it or something? I find it unlikely that someone would come to Seoraksan and then buy a set of drawers to take home though. The guy with the ladder had just finished cleaning the windscreen of his bus. After catching the bus back to Sokcho, we bought our tickets for the bus back to Seoul. We had about 15 minutes until the bus was due to leave, so we had a quick look around the area near the bus station. I found the name of this shop quite strange. It isn't a typo, Good Morning 25hr Mart (Hangeul: 굿모닝 25시 마트) is the real name of the shop. 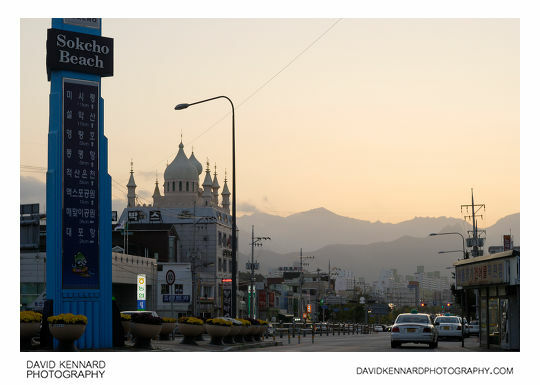 The above photo is looking back west along the main street, towards Seoraksan. 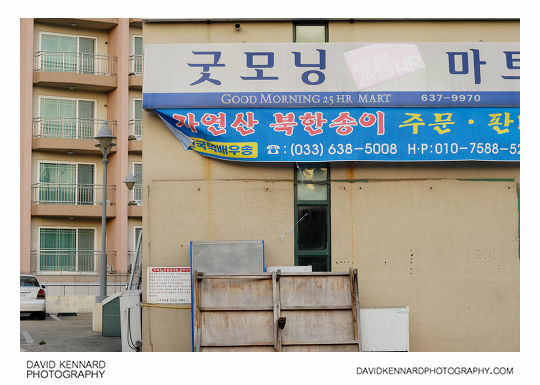 You can see the Samsung Motel (Hangeul: 삼성모텔) with its domed tops again in this photo. 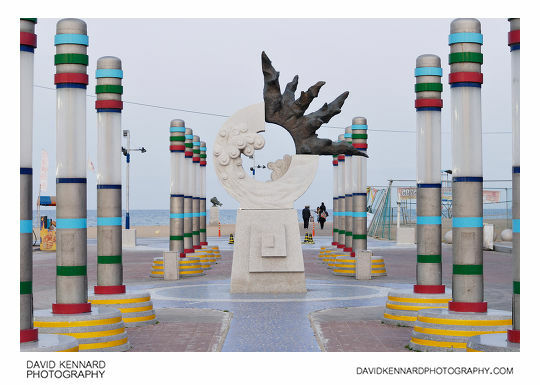 This photo is looking towards the beach, which is very near the bus station. Presumably the large bollards light up when it gets darker, but it must not have been dark enough yet when we were there (around 6.30pm). From the edge of the beach you can see this small island. 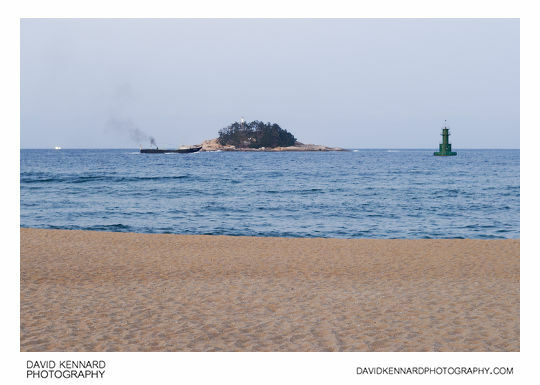 The island's name is Jodo (Hangeul: 조도; Hanja: 鳥島), which means 'Bird Island'. The island is used by many seabirds, I would guess for nesting / breeding, but Google translate's Korean isn't quite good enough to determine that. Before going back to the bus station I took a photo looking back towards the town from the beach area (above). 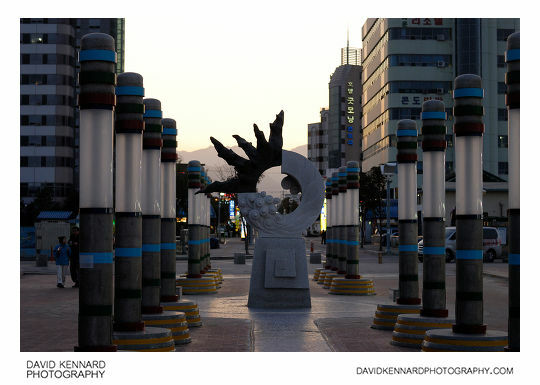 I did also take some photos when we got back to Seoul bus station, but unfortunately I didn't use a high enough ISO so they ended up all blurred due to camera shake. And that was the end of my day out to Seoraksan. Although we didn't actually spend much time in Seoraksan (just an afternoon), it was still a nice day out. I think the South Korean government is currently working on a high speed rail system, so in the future it may be much quicker to get to Sokcho / Seoraksan from Seoul than having to take the bus.